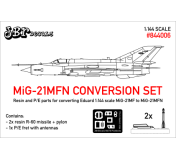 Complete set for conversion of 1:144 scale MiG-21MF to MFN version. Contains P/E fret with antennas (available separately as set no. 844005) and 2 pieces of R-60 missile with pylon and launcher rail.